High five, taste buds. 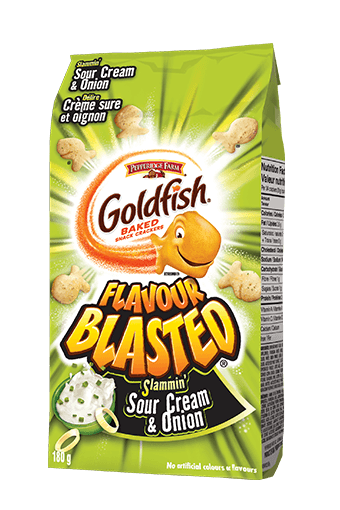 Goldfish® Flavour Blasted® Slammin’ Sour Cream & Onion crackers are loaded with extreme flavour. ENRICHED WHEAT FLOUR, VEGETABLE OIL (CANOLA AND/OR SUNFLOWER), PARMESAN CHEESE (MILK), SEASONING (SALT, CREAM SOLIDS, WHEY, ONION POWDER, SUGAR, MALTODEXTRIN, SOUR CREAM SOLIDS, AUTOLYZED YEAST EXTRACT, CULTURED WHEY, GARLIC POWDER, DEHYDRATED PARSLEY, CITRIC ACID, LACTIC ACID, CALCIUM LACTATE, MODIFIED CORN STARCH, DISODIUM INOSINATE, DISODIUM GUANYLATE, NATURAL FLAVOURS, SPICE, BUTTER OIL), SALT, YEAST, ONION POWDER, SUGAR, BUTTER, AUTOLYZED BARLEY YEAST, AMMONIUM BICARBONATE, TRICALCIUM PHOSPHATE, BAKING SODA, SODIUM PHOSPHATE.